On sale! 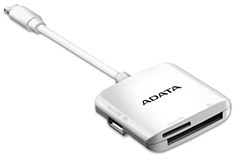 (normally $59) The ADATA AI910 Lightning Card Reader Plus carries official Apple MFi certification and is designed for easy interconnectivity between iOS, Android, and Windows. Whether saving, uploading, or sharing, it’s up to the task with maximum coverage thanks to the inclusion of SD and Micro SD slots and support for cards up to 256GB. The AI910 works with a wide range of file formats, including professional RAW images, 4K video, and files bigger than 4GB. It’s perfect for DSLR and action cam users, as well as designers and anyone that wants two-way content movement with three-way operating system support that applies to virtually every device available: smartphones, tablets, laptops, and desktops.